The 2018 Acura MDX on its own is quite exemplary, but tack on any of the many available packages, and this three-row luxury SUV reaches a whole new level. Get the best in technology features or incorporate more luxurious elements when you opt for any of these available packages. But first, discover the features you can expect from each of the 2018 Acura MDX packages when you shop at Acura of Ocean! Opt for your MDX with the Technology Package to access the exclusive Acura Navigation System with HD Traffic, remote engine start, and the Acura/ELS® Studio Premium Audio System with 10 speakers, among other technologies. Luxury and convenience are top priority for this package, which boasts second-row captain’s chairs, heated and ventilated seats, Milano leather upholstery, natural wood accents, and more. Hitting the road has never been so fun. Combine the Entertainment package with either the Technology or Advance packages for rear-seat entertainment, wireless headphones, surround sound, and more. With the upcoming Sport Hybrid Upgrade, you may notice performance boost with this upgrade thanks to an Active Damper System and the Integrated Dynamics System Sport+ Mode. 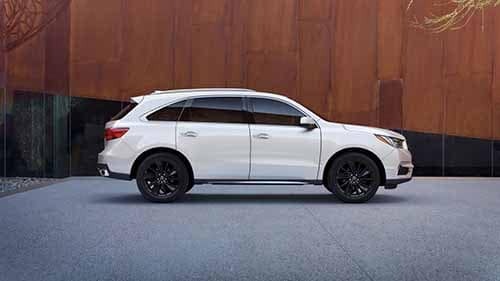 You can get your 2018 Acura MDX with any of these packages when you shop at Acura of Ocean! All MDX models start with base features like the AcuraWatch suite of driver assistance technologies, advanced connectivity, Automatic High Beam Headlights, tri-zone automatic climate control, and keyless entry – much more when compared to competitors like BMW. Contact the dealership to discuss your options to further outfit your MDX with these available packages and other additional accessories ranging from fog lights and 20-inch wheels to items for optimum storage on the roof of your car!